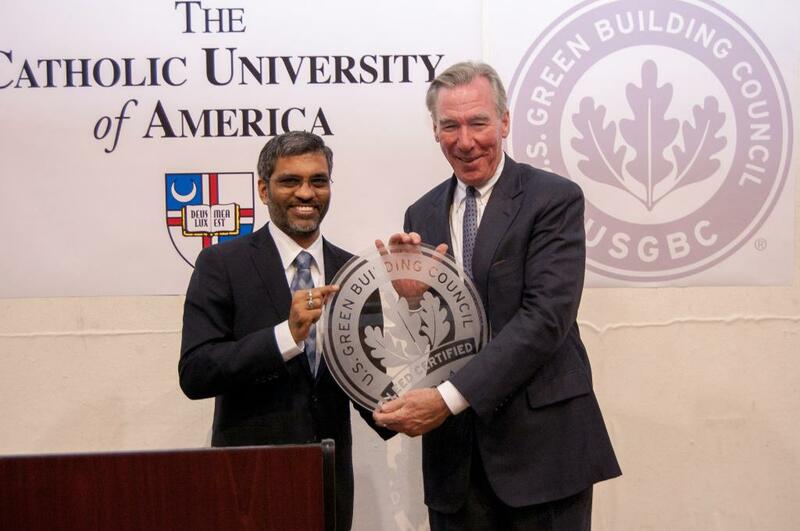 The Chief Operations Officer of USGBC formally presented the LEED Plaque to President Garvey. As a result of the efforts of students, staff, and faculty involved in the LEEDlab course, the Edward M. Crough Center has received LEED O+M Certification! The course is a laboratory for students to experiment with various quantifiable synergies and policy revisions in order to reach the most optimal sustainable goals towards certifying existing campus facilities through direct collaboration between students, faculty and a third party green organization. LEED Lab implements the LEED Existing Buildings Operations and Maintenance (O+M) rating system within existing campus buildings seeking LEED certification for the first time and LEED Certified buildings seeking recertification. Students in the course assess the performance of existing buildings on campus by learning how to meter and track various building systems such as electricity, energy, water, and transportation. By implementing sustainable policies and measures with our administration, Catholic University will achieve a performance-driven sustainable campus through actual third party LEED certification, starting with the Crough Center for Architectural Studies and continuing this semester with the OPUS HALL dorm. LEEDlab is an elective course offered within the Master of Science in Sustainable Design program which is open to both undergraduate and graduate students in the School of Architecture and Planning as well as in other schools at Catholic University. Since the LEEDlab course covers many disciplines we welcome students enrolled in other majors. LEEDlab also qualifies as one of the Sustainable Operations and Practices courses (Category D) in the Sustainability Minor. Visit the LEEDlab website here. 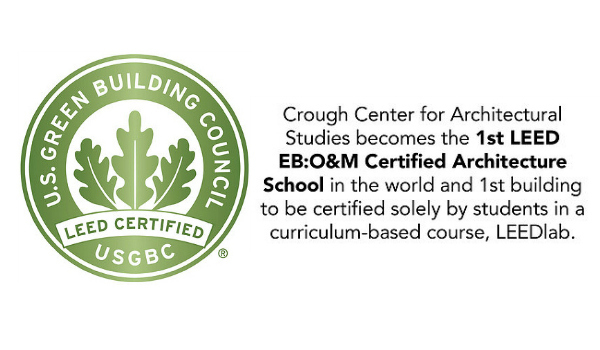 The Crough Center for Architectural Studies becomes the 1st LEED EB:O&M Certified Architecture School in the world and first building to be certified solely by students in a curriculum-based course, LEEDlab.